Across the city, Detroit police arrive in about 14.5 minutes for urgent Priority 1 calls, such as active shootings, robberies and assaults. That’s down from 20 minutes in late 2015 and from over 50 minutes in 2013. Source: Bridge analysis of Detroit Police calls for service. Detroit police response times are more varied for non-urgent calls, from 10 minutes in Midtown to over an hour in areas of the northwest and east sides. Police say those higher rates reflect higher crime rates, with officers spending more time on more pressing situations like shootings. Detroit police are responding to emergency calls far faster than a few years ago — and it doesn’t matter if the call comes from Ford Field, East State Fair or Gratiot. Where it used to take over 50 minutes for cops respond to Priority 1 calls – those involving violence like active robberies and shootings – the citywide average is now about 14 ½ minutes, according to a Bridge Magazine review of more than a half-million service calls over the past year. But with the police department continuing to struggle with a shortage of officers, the response to non-emergency calls – like reporting a theft or a neighbor’s loud music – varies widely in the city, from 10 minutes in the neighborhoods and business districts straddling Woodward to more than an hour in the far east and west reaches of the city. And that may fuel anger in a city increasingly sensitive to a “two Detroits” narrative, which suggests that bustling Midtown and downtown are favored over the neighborhoods. “Citizens are still concerned about response times,” said Willie Bell, a member of the Board of Police Commissioners, an elected oversight panel that hears citizen complaints. Police and other officials say the more relevant number is the time it takes to respond to serious crime – and the data show the average response time for most of the city is within 3 minutes of the 14 ½ minute average. That’s far below the nearly one hour it took in 2013 and substantially below the 20 minutes in 2015. “They’ve really done a remarkable job driving down response times,” said David Martin, director of Wayne State’s Center for Urban Studies who specializes in mapping crime and is working with Detroit through a crime-reduction program sponsored by the U.S. Department of Justice. In areas of Midtown near Wayne State, police respond far quicker than the city average – but that’s in large part because the Wayne State University Police Department picks up some of the calls in the area, officials said. Outside of Wayne State’s coverage area, most parts of the city get similar service from the department when it comes to the most serious crimes. Bridge analyzed more than 550,000 calls for service that covered a year that ended in September, in data the city posts online. Bridge only looked at calls from residents and excluded calls in which the response was more than 4 hours or less than 10 seconds to eliminate traffic stops and outliers, including calls where officers forgot to report back. That left more than 250,000 calls, a quarter of which were considered Priority 1. The consequence of focusing on Priority 1 calls is that other calls take a back seat and response times jump markedly – and vary wildly. For instance, in the Berg-Lahser neighborhood bordering Eight Mile, in northwest Detroit, it took nearly 68 minutes, on average, to get to non-emergency calls. In North Corktown tucked north and west of I-75 and the Lodge Freeway, the average was 35 minutes. Closer to Wayne State, where university police also respond, that time plummeted to 10 to 20 minutes, the data show. Neighborhoods with a larger percentage of Priority 1 calls typically must wait longer in non-emergencies, according to Bridge’s analysis. That’s because Priority 1 calls are more complicated, taking 30 minutes or more to handle, leaving less time for non-emergencies. Berg-Lahser, for instance, is in the 8th Precinct, which has some of the highest crime rates in the city. Detroit City Councilman James Tate said he regularly explains to frustrated residents that police must prioritize calls. Most residents believe their call should be the highest priority, Tate said, even though common sense dictates it can wait while police respond to, say, a shooting 2 miles away. 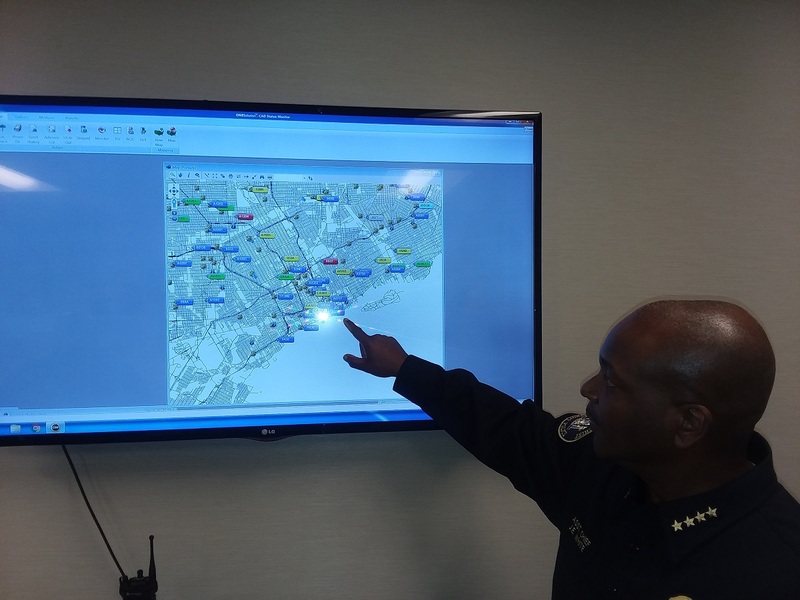 Detroit Police Assistant Chief James White points to an electronic location board for monitoring police cars. Detroit was late to embrace GPS technology, adding it to police cars in 2013. That allows dispatchers to monitor the location of cars and assign them to emergencies based on location. Before, dispatchers had to radio officers and ask who was closest. “That’s what you have to explain to people,” said Tate, who represents District 1 in the northwest part of the city, and is a former police deputy chief and once served as department spokesperson. RELATED: Promises, meet reality: Measuring Detroit Mayor Mike Duggan’s first term. To significantly improve, the city needs more officers on the street, Tate said. The city is aggressively hiring police, hiring 665 officers since 2015, according to city records. But the hires haven’t kept pace with attrition, as officers retire and younger ones leave for other departments. Pay is low – starting pay is $36,000 – for a job in a city the FBI last week declared the most dangerous in America (the city disputes with the designation). The Detroit police added 55 officers in July to give it 1,700 officers. That’s still more than 120 short of the city’s budgeted allotment. And it’s far fewer than the 2,500 it had five years ago, according to FBI statistics. James White, assistant police chief for support operations, said the department continues to improve its procedures and adding officers isn’t the only solution. Tate and Bell, a retired police officer, disagree. “We are still under strength,” Bell said. Outrageous response times were one of the symptoms of a failed city that Emergency Manager Kevyn Orr used to persuade a judge to declare the city bankrupt. Orr claimed the response time peaked at 58 minutes. Orr hired former Cincinnati Police Chief James Craig, a Detroit native, to take over as police chief in May 2013. Craig oversaw sweeping changes, not the least of which was reducing the number of calls that would get a Priority 1 response. The the impact was immediate: Priority 1 call volume fell from about 2,500 to 1,300 a week in the months after the classification change – and response times likewise fell. By July of 2015, response times averaged 16 minutes, according to the department. The department also changed how it took calls, asking questions in a more structured, deliberate way, and improved how it monitored its rolling fleet of cars. Prior to the change dispatchers did not know where cars were, even though GPS technology existed in every car. “When you weren’t responding to a call, you could be anywhere,” Martin said. The department, White said, wasn’t using GPS, and dispatchers had to use radios to ask if cars were available. That added precious minutes to response times. Now, White can sit in his office at police headquarters and watch – as all dispatchers can – the location of every department car, like a giant Uber app on a big-screen TV. There are red, yellow and blue cars and everyone knows which car is closest to an emergency. Should a car stay red – out of service – too long, White may pick up his radio and ask why. The department made other changes that affected personnel. It moved officers away from downtown and out into the precincts and the number of officers assigned to different shifts is determined based on historic crime patterns, putting more officers on the road when – and where -- crime is most prevalent, White said. “We’re just a little bit smarter in how we police,” White said. Bell said Detroiters are “very patient,” and when it comes to response time in the past, they had to be. Now, there are more complaints about cars speeding down neighborhood streets than a lack of police cars on those streets, Tate said. But, in a city still reeling from crime rates unseen in almost any other American city, residents can still fume when their call for helps takes too much time. I'm curious, is there any particular reason why MSP wasn't included in this? As I understood it, they were actively patrolling within Detroit and taking up some of the load from these calls, until the community agitators got involved and drove them out. Up to that point, their presence should've had some effect on the overall numbers contained within the report. Hi Kevin -- MSP wasn't included because their data isn't publicly available. A faster response time on the "low-priority" runs would result in fewer high priority runs. Recently, a home burglar with a warrant out for his arrest got away in our neighborhood because DPD took 4 hours to respond to what they considered a "low-priority" run. Also because the detective was on vacation, and apparently, they can't serve a warrant unless the detective is on the premises. This is why we're asking for a 30 minute guaranteed response time to all 911 calls. It should be the #1 priority of all city leadership, including James Tate and Mike Duggan.